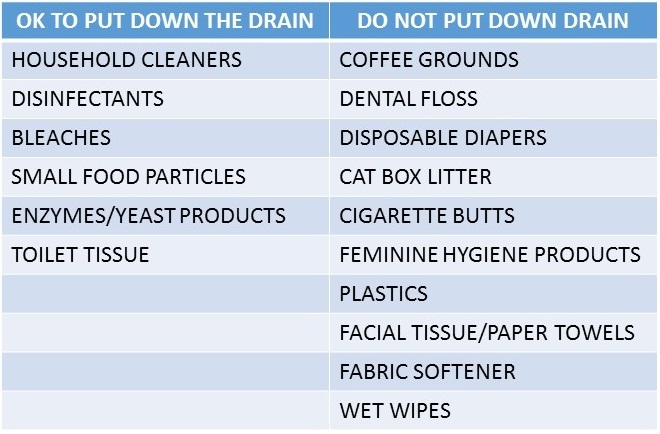 The question we are asked most often is, “how often should I have my septic tank pumped?” The chart below provides a handy guideline for pumping schedules. As a general rule, most tanks need to pumped every 3 to 5 years, depending on the size of the tank, daily flow of wastewater into the tank, & use of garbage disposal. *" At the time the tank is being pumped, your technician should be able to help you determine how long to wait before having it pumped again. Proper maintenance of your system will provide trouble free operation and add years to its potential lifespan. what does a typical residential pump out service entail? Limit or stop using the garbage disposal. Avoid putting large amounts of harsh chemicals down drains. Don’t flush non-biodegradable products such as baby wipes and feminine hygiene products. Conserving water use in the house ensures slow movement of wastewater into the septic tank, reasonably complete digestion of solids and slow trickling of wastewater from the tank to the disposal area. Septic odors (outside): Plumbing vent pipe is shorter than the highest point of the home’s roofline or tank doesn’t have inlet tee. Septic odors (inside): The drains for each fixture in your home (sinks, bathtub/showers, toilets) have a U-shaped trap in them. This trap holds water and creates a barrier that keeps septic gases from entering the house. If any of the fixtures are not used on a regular basis, the water in the traps will evaporate and the gases will find their way into the house. Generally speaking, odors inside the house can usually be traced to a plumbing problem and should be immediately discussed with your plumber.